South Africa 1-99 (Quinton de Kock 48*, Faf du Plessis 37*, Sohail Tanvir 1-21) beat Pakistan 9-98 (Umar Akmal 49, Shoaib Malik 12, Dale Steyn 3-15, Lonwabo Tsotsobe 2-9) by nine wickets. Pakistan managed 98 runs for the loss of nine wickets in 20 overs and South Africa blasted 99 with nine wickets available and 33 balls to spare. 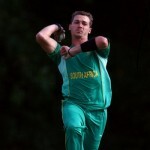 Dale Steyn (South Africa) was declared ‘Player of the match’ for his deadly fast bowling. The first Twenty20 of the two match series was played on Wednesday, November 13, 2013, at Dubai International Cricket Stadium. 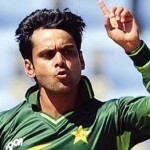 Earlier, Mohammad Hafeez won the toss for the Green Shirts and decided to bat first. The decision bounced back when their three top order batsmen departed for four mere runs in two overs. Shahid Afridi became the next victim at 21 when Umar Akmal joined in with Shoaib Malik. They crept to 41 when the latter was gone for 12 and the late order batsmen surrendered without any resistance. Umar Akmal was the 8th batsman who left the field for 49 as the home side reached 9-98 in 20 overs. 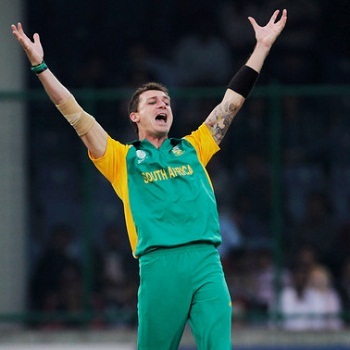 Dale Steyn was the star performer with three wickets, Lonwabo Tsotsobe and Imran Tahir shared two each whereas Ryan McLaren got one wicket. 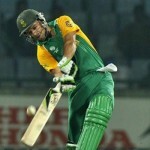 Hashim Amla was clean bowled by Sohail Tanvir for 13 when his skipper, Faf du Plessis associated with the young gun, Quinton de Kock. The batting looked so easy for both of them and they were sending the ball out of the fence regularly. The left arm spinner, Abdur Rehman, was punished for 18 runs in his very first over with a couple of giant sixes from de Kock. He remained unbeaten for 48 off 38 deliveries with 2 lofty sixes and 3 fours, du Plessis secured his end at 37 from 40 comprising 1 six and 4 fours as the tourists piled up 1-99 with plenty of overs to still available. 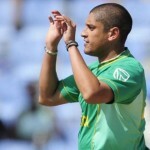 South Africa clinched the encounter by a hefty margin of nine wickets and leads the series 1-0.